A new disc from a new record label. In 2011, the German music publisher Edition Peters set up a London-based artist management agency, and now with this release they are adding a record label to the portfolio. There is plenty of precedent for this sort thing, of course, even if it does suggest an industry shrinking to the point that companies must cover all bases to remain viable. Edition Peters brings all the production values of its sheet music to the project. The packaging is attractive, the texts readable and relevant, although a little more on the music itself might have been nice: We get a short essay from the pianist himself about the works, and of course an artist bio. Peters also includes a cheeky advert for their own edition of the music. 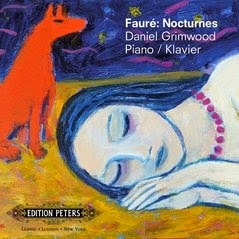 Fauré’s nocturnes are an excellent choice for this first release, attractive and engaging music that is all but unknown, with only a handful of competitors in the catalogue. It is difficult to hear them as a cycle – they span opp. 33 to 119 – but there is remarkable stylistic consistency here. And variety too. Fauré regularly strays from his brief and indulges in dramatic and virtuosic climaxes. The nocturnal mood is always retained though. And whatever else we might say about this music, there is never any suggestion that the composer is under Chopin’s thumb. Most of the competition on disc is from French pianists, Pascal Rogé and Jean-Michel Damase among them. Daniel Grimwood’s readings aren’t as dreamy as theirs, but they are just as convincing. One of the points Grimwood makes in his liner essay is that Fauré’s harmonies are radical, if in a modest “conservative revolutionary” way. The pianist goes out of his way to present these unusual harmonic progressions with the utmost clarity. There are also many unexpected suspensions and piquant dissonances, which he always relishes and even lingers on. The recording was made at Nimbus’ Wyaston Estate Studio and the audio is excellent, a little on the dry side but always involving and clear. Recommended then, as much for the fine performance and recording as for the fascinating and too rarely heard repertoire.